All photography by Jack Dickson. When I walked into the NYUAD Project Space to meet Julie Stopper for a tour of her exhibition Night Light, I saw a group of students sprawled on the floor, huddled around a computer, giggling at the screen. Stopper was sitting pretzel-legged amongst them. “We’re watching Harry Potter fan fiction,” one of them explained, inviting me into their circle. “I strive to contradict gallery etiquette,” Stopper, a self-proclaimed “millennial interdisciplinary installation artist,” told me on a walk-through of the exhibition. What is gallery etiquette? I pondered as I walked throughout the space. After the walk-through, I was shocked to learn that a Google search of “gallery etiquette” yields 12,500,000 results. I had assumed that “gallery etiquette” described a mystical, unsaid set of expectations that circulated amongst art professionals and art-loving socialites, not a set of rules written for the whole world to see. One website lists “Behavioral Blunders for Artists” and “Behavioral Blunders for Everyone,” like talking to the artist for too long, wearing a backpack, or touching the art. Seeing individuals canonize what is not welcome at art events made me realize just how unfriendly “art” and art spaces can be for the public. 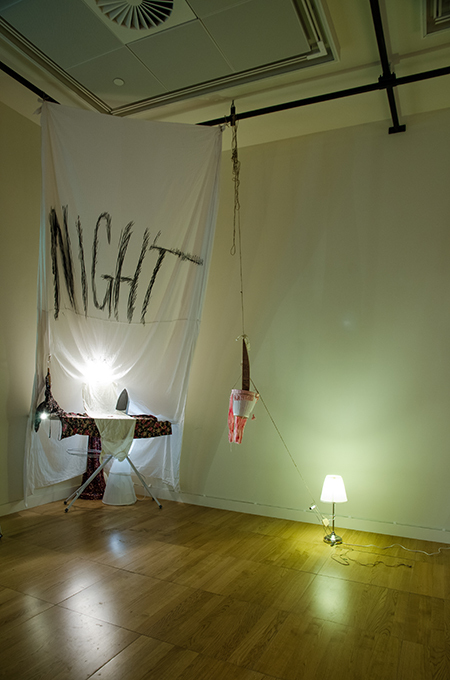 Night Light‘s installation rejects the white cube as a sterile template for art exhibition. The space felt immediately comfortable and inviting. Warmly lit by lamps resting directly on the floor, their bases wrapped with floral-patterned clothing, what is usually functional in exhibitions became sculptural forms with personality. “I hope for my work to be intriguing and accessible to a wide audience,” Stopper said to me, her voice conveying absolute sincerity. Night Light was inspired by F. Scott Fitzgerald’s quote about creating dynamic characters, “Ah, to be both light and dark. There was something to be done,” which Stopper cites in her artist statement for the show. Beyond her exploration of literal light and dark space in the gallery, Stopper also writes that “what is truly beneath the skin of the exhibition is the exploration of a light and dark mental state.” Her interpretation of the show as an inner-body experience that sinks beyond the skin is intriguing: her works attempt to lure audience members’ focus away from surface level fixations and into another state or place. The vernacular of the exhibition– a mattress, torn bed sheets, a bed frame, women’s clothing– indicate the topics of sexuality and femininity, in a narrative not immediately obvious but necessitating a careful look. Stopper walks me to an ironing board in the corner of the room and introduces “the wall text.” In reality, this is a cloth with the names of all of her collaborators — among sound artist João Menezes, contemporary dancer Nella Turkki, lighting designer Brooks Fowler, and curatorial director Cleo Smits, Stopper continues to list anyone “who had a hand in the installation process,” from the video technician to the poet-in-residence — handwritten in black ink. Stopper cites Pablo Neruda’s quote from his essay Poets of the People to explain her embrace of every collaborator as an artist: “I have always preferred a poetry where the fingerprints show.” (Stopper is a walking repository of artists’ quotes, and she peppered our conversation with inspiring words from visual artists, authors, and rappers with equal ease and conviction.) “What would happen to the art world if every single person involved in every exhibition got their name up on the wall?” she asked me. She did not wait for my answer, but her question was not rhetorical. With this exhibition, Stopper addresses a simultaneous “claim and reclaim.” What is generally a universal commonplace material — the bedsheet — she claims as a material language in order to speak about issues of sexual violence and processes of trauma recovery. Along with this gesture of bringing this conversation into the commonplace, Stopper reclaims this material not as a language of “stain” in relation to “victims,” but rather a language of beauty and strength in relation to survivors. Reminiscent of a domestic setting, the exhibition is broken up into three implied rooms. We moved from the ironing board to an upright bed frame, part of a piece entitled “a bedsheet used as a rag displayed as a work of art.” Stripped of its accouterments which make it immediately recognizable, this bed frame is also flipped from a passive, horizontal position to an active, upright stance. 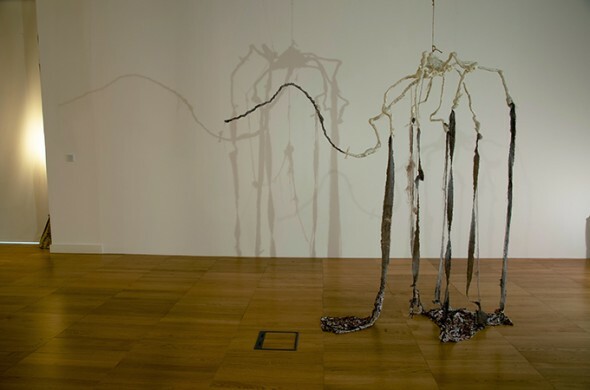 A twine web is woven into its ribs, its shadow looming clearly behind the standing frame. At the heart of the web’s shadow is a black blotch, seemingly the victim of a hungry spider. Looking at the sculptural form, I see that this dark patch is actually a white cloth, which dangles in front of the web rather freely. Torn from a bed sheet, the cloth is smudged with pink-red stains that recall blood. Stopper explains that this piece is where the material transformation of the bed sheet begins. It is the moment of trauma or “stain.” I immediately see references to Desdemona’s white handkerchief, spotted with red strawberries: a piece of cloth whose symbolic weight is constantly transformed by individuals’ imaginations. These spiders are clear homages to Louise Bourgeois’ spiders, symbols of motherhood as well as protectors against evil in her oeuvre. Rather than bronze, Stopper’s sculptures are made of wire, wood, her own floral dresses, and wrapped in Stopper’s transformative vocabulary of the bed sheet. The motif of the spider, Stopper is discovering, is prevalent throughout cultures and times. Sheikha Al Mayassa Bint Hamad Bin Khalifa Al Thani points out in her foreword of Louise Bourgeois’ retrospective Conscious and Unconscious “In the Muslim world, you cannot look at the spider without thinking about the story of the spider in the Holy Qur’an and how it protected the Prophet Mohammed.” I suggest the spider as a nurturing, wise character in E.B. White’s Charlotte’s Web, a cultural reference that saturates childhood in the United States. Using the spider is not a project in redefining the emblem as much as unearthing its history. 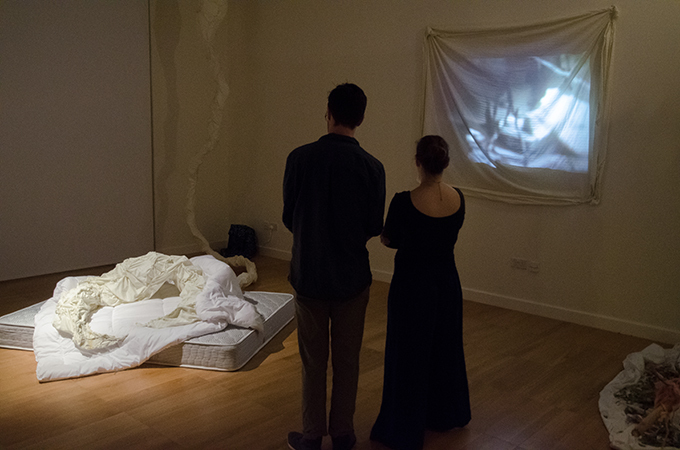 One of the most striking pieces in the show is also in this space: a mattress on the ground, white bed sheets thrown atop, and a tubular stitched duvet that looks like a shed snake skin to me but which Stopper explains is a siren, referring both to the mythological reference and to the literal meaning of an “alarm”. One of Stopper’s favorite moments from her show’s opening night was the execution of a performance piece by one of her collaborators who sat on the mattress and curled up with the siren, using it as a comforter. Not only does Stopper embrace this defiance of “proper,” timid gallery interaction, but she also felt this interaction further transformed the bed from a place of fear to a place of protection. As I traveled through the space, I realized that Stopper is ingeniously expanding the vocabulary of the mattress: by deconstructing its parts and focusing on each individually, using the bed frame, sheets, and pillowcases. The mattress piece immediately brings to mind Young British Artist Tracey Emin’s My Bed and Columbia student Emma Sulkowicz’s Carry That Weight senior thesis project and national campaign against sexual assault. Given NYU Abu Dhabi’s participation in the Carry That Weight campaign in October, in which students carried a mattress together across the High Line and around campus, the reference to Sulkowicz is well-known in our community. 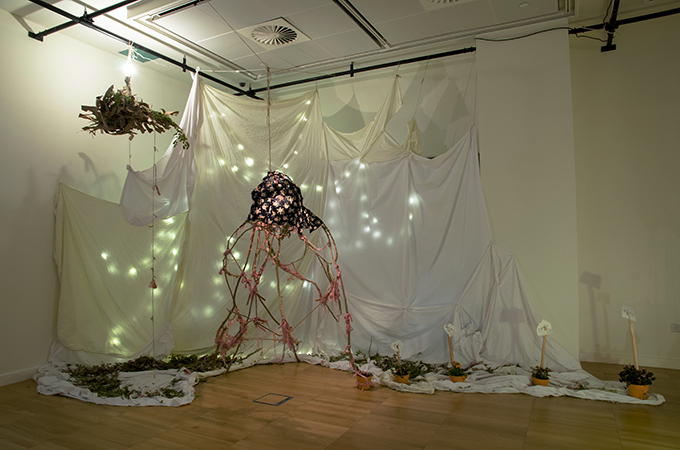 But this exhibition is part of a global conversation, Stopper says, and she has been working directly with the theme of empowerment through vulnerability and the conquering of fear since she began collaborating with Sofia Mish, contemporary poet, eleven months ago, well before she arrived as a Visual Arts Fellow on campus. The grand goal of Stopper’s Night Light is to become exactly that — a night light. To illuminate the darkness with a glimmer of hope. To abolish the fear of the ominous monsters in our bedrooms. She hopes to fulfill Mary Karr’s notion of bringing the viewer or reader “into a community of like sufferers” through art. “There’s healing in that,” writes Karr, which gives the community “the conviction to live” their lives. The exhibition touches upon sexuality and trauma, but so much more than that: individual empowerment to live the lives we intend to lead. 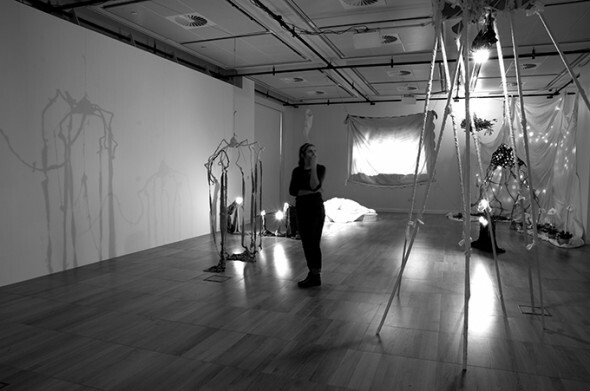 “Art is always about a community experience,” Stopper says, “and this shared experience is an empowering experience.” This statement applies to every aspect of the show: each collaborator joins a recognized artistic community, and the viewers enter a community dialogue about what, at its essence, is the human condition, for isn’t sleeping in a bed at night a universal human experience? Night Light has also acted as a tool for her to meet new individuals in the community. “Art, for me, is abstract oxygen. Everyone breathes it whether they realize it or not. The art experience then becomes a meeting place, like the eye of the storm, a safe space for everyone to go,” Stopper says. For instance, through her exhibition, she entered conversations with the students planning Headspace: A Reading, a community-based performance about gender issues, sexuality, and women’s health in the NYUAD community that will be held on December 13. We must not stand still. Taking one last look around the exhibition before I leave, I noticed how prevalent the motifs of bed sheets and spiders are to Stopper’s work. Stopper claims what some interpret as symbols of fear or nightmare and reasserts them as emancipating icons. What strikes me is how much Stopper herself embodies the wise, maternal spider. 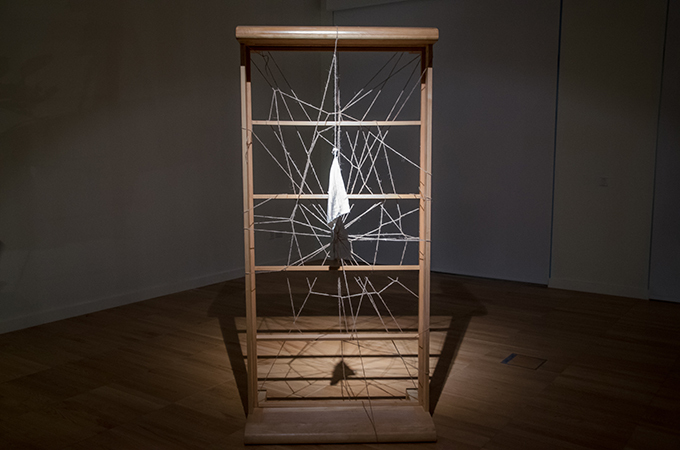 She creates a homely, safe space in an otherwise unwelcoming or intimidating white cube; she weaves a story and spins a web that connects her to students on campus, in New York, artists passed away, and new collaborators, like Sofia Mish.